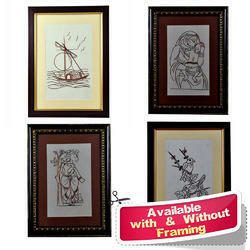 Leading Exporter of copper wire art theme products from Hyderabad. Owing to years of professional knowledge and experience, we are efficiently engaged in offering Copper Wire Art - Other Theme Products. Our offered wire art is designed by our skilled artisans using optimum quality material & copper wire for doing amazing arts as per the market trends. The given wire art is renowned for its stunning shine. This wire art is made available in various designs and finishes in accordance with the clients' requirements. Looking for Wire Art ?